Tony Finau is averaging 327 yards off the tee. That’s a lot. Tune into any PGA Tour event, and it won’t be long before the broadcast team comments on Dustin Johnson’s can’t-miss power off the tee. This is for good reason: Johnson is a 6-foot-4 freak who hasn’t finished worse than second in average driving distance since 2012 or worse than fourth over the past decade. He’s also presently the No. 1 golfer on the planet. Last season, he won four tournaments, claimed $8.7 million in earnings and accounted for four of the 15 longest drives on tour, including a tour-best 439-yard bomb at the Bridgestone Invitational. But nearly five months into the PGA Tour season, the biggest hitter on the links isn’t Johnson. It’s Tony Finau, the first golfer of Tongan and American Samoan descent to hold a tour card. While he gets far less attention than DJ, he’s currently on pace for the longest driving season in PGA Tour history. Finau’s entire game has turned the corner this season. He’s already finished in the top two twice and inside the top 20 in six of nine starts.1 Finau ranks seventh in the FedEx Cup standings and has raised his world ranking to No. 32 — up from No. 88 at the end of 2016 and No. 40 at the end of 2017. But while he’s playing better everywhere on the course, Finau is putting on a show in the tee box. With 327 yards per drive, the 28-year-old is smashing the tour average by 32 yards. It goes without saying that a lot has changed in terms of technology and training since Jack Nicklaus, Ben Hogan and Arnold Palmer were marquee figures — or even since John Daly was pounding beers during rounds and wowing fans with his long drives. In 1980, the first year for which data is available, Dan Pohl led the tour with an average driving distance of 274.3 yards. In 1997, Daly became the first man on the PGA Tour to average at least 300 yards per drive; this season, 65 players are on pace to do so. Finau is an incredible athlete who turned down Division I basketball scholarships to go professional in golf, and his sturdy 6-foot-4, 200-pound frame no doubt has a great deal to do with his eye-widening drives. The top four drivers on tour this season are all at least 6-foot-2. Plus, as Finau has said, before he learned how to hit the ball straight, he first learned how to hit it far. But what has changed this season? Like any dexterous big-hitter, Finau starts with a wide base and balance as he approaches his ball. Despite possessing cable-like arms — “arms like an orangutan,” as he put it — Finau has an extremely compact swing, unleashing his lower body through the ball. Drives don’t exist in a vacuum; there’s a whole host of factors that play into distance off the tee, including launch angle, club head speed and spin rate. Last season, Finau’s average club head speed was 123.1 miles per hour, but that figure has dropped to 122.2 mph this season. His spin rate also dropped: He ranked ninth a season ago, but this season he ranks outside the top 80, meaning his ball is generating more carry — 1.1 yards more, in fact. Finau is also showcasing a higher launch angle this season. An obscene 90.9 percent of Finau’s officially measured drives this season2 have eclipsed 300 yards, a mark that would obliterate Hank Kuehne’s record of 85.8 percent since PGATour.com began tracking the statistic in 2001. Consistency has been key for Finau: His longest drive this season, 391 yards at the Farmers Insurance Open, ranks outside the top 100 among all players. So he isn’t raising his average with a few bombs here and there — he’s doing this every time he tees it up. It’s worth noting that Finau’s marks are based on only 44 drives this season, around the same number you get when you purchase a medium bucket of balls at the practice range. The season doesn’t end until late September, so a lot could change; regression to the mean is always possible. 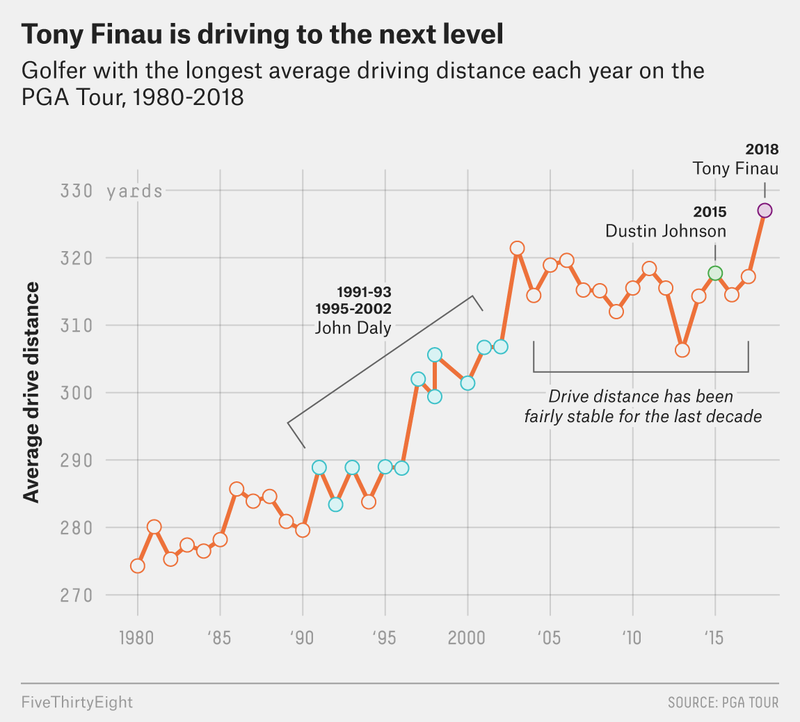 But right now, if nothing else, Finau is swinging for history — and transcending our understanding of consistency at the tee box while he does it. Finau still has only one tour victory in his career. If that number changes in the coming weeks and months, people might forget about Johnson’s drives and take more notice of Finau’s. The current PGA Tour season began in October 2017. Because there’s no formal tracking of club selection, the tour measures only two drives per round, on specific holes, to safely assess driving capability.